Flash My Brain - Ganbatte! 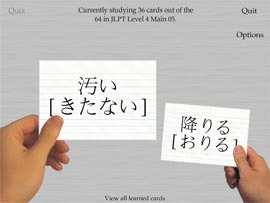 Study and create Japanese flash cards with Flash My Brain! Ganbatte! 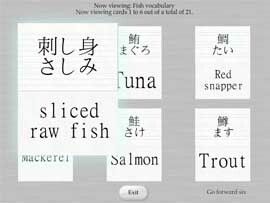 Study and create Japanese flash cards with Flash My Brain! Flash My Brain helps you study Japanese, from Kanji characters to honorifics to grammar. 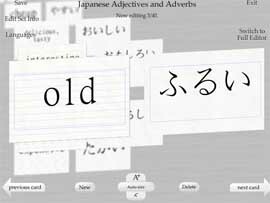 Use Flash My Brain's existing library of 1000s of Japanese flash cards or easily create your own. Flash My Brain is one of the few online systems that happily accepts Japanese input. The Flash My Brain community even offers resources to help you figure out Japanese input on your computer. Print out a quick set to cram before class! Hiragana, katakana, kanji, romanizations, even pictures and sounds! Flash My Brain is the ultimate tool for learning Japanese through flash cards. 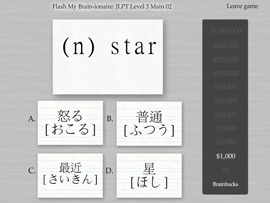 Buy Flash My Brain for $39.95 and start accelerating your Japanese studies with Flash My Brain flash cards! Make and print flash cards. Learn and review effectively. Flash My Brain even has mini-games to help those kanji readings sink in!